These worksheets will help review the lesson greetings. You will find tracing worksheets, crossword puzzles, word search puzzles, matching exercises and more. 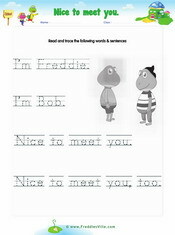 This is a greetings worksheet that focuses on the popular greetings word ‘hello’.